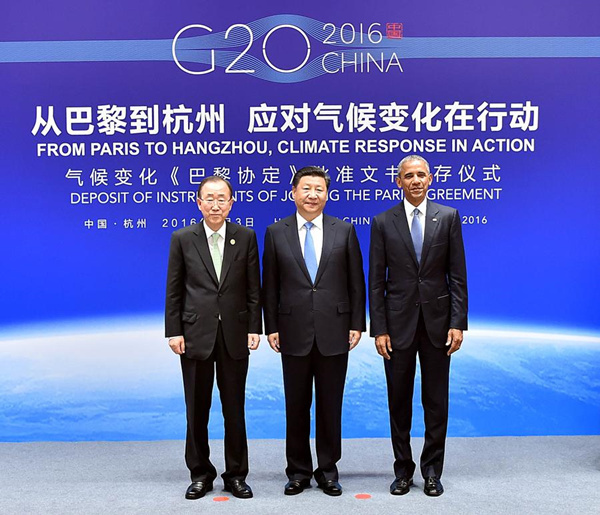 China and the United States showed leadership and commitment in tackling climate-change challenges as they formally committed to joining last year’s Paris Agreement on climate change on Saturday ahead of the G20 Summit. "China and the United States have expanded dialogue and achieved fruitful results in recent years to tackle global climate challenges," said President Xi Jinping, commenting on the two countries’ efforts to advance climate-change initiatives since 2014, when the two countries submitted their respective emission goals for the Paris Agreement. Xi and US President Barack Obama submitted formal agreement documents to United Nations Secretary-General Ban Ki-moon. China pledged to peak carbon emissions by 2030, while the United States pledged to cut emissions by 28 percent by 2025 compared with the level in 2005. The formal commitment to the agreement by the two major countries, which together account for a large proportion of the world’s carbon dioxide emissions, sets a good example for other G20 members who signed the Paris Agreement to facilitate ratification, experts said. China and the US, as the world’s two largest emitters, are "setting a powerful and positive example" helping to spur momentum toward the rapid entry into force of the agreement, said David Nabarro, the UN secretary-general’s special adviser on sustainable development. "China’s example demonstrates that a low-carbon and climate-resilient development is not only feasible but beneficial on many fronts," said Nabarro. The special adviser said UN Secretary-General Ban Ki-moon will be hosting an event on Sept 21 at the UN in New York to build on the strong momentum coming from the G20 Summit for ratification of the Paris Agreement. As China moves quickly to use more clean energy and scale up green technologies, Nabarro said China is also demonstrating strong resolve in tackling air pollution caused by the burning of fossil fuels, and is promoting more sustainable urbanization. By 2050, one quarter of the world’s largest cities will be in China. "The way in which Chinese cities develop and address climate change may well serve as a model for the world’s cities in both developed and developing countries," he said. "Commitment and efforts being made by the two countries send strong signals to other G20 members to quicken the pace of their own legislative process," said Bai Yunwen, a climate and policy researcher at Greenovation Hub, a Beijing-based NGO. The G20 members are responsible for 75 percent of global emissions, and their energy-related greenhouse gas emissions increased by 56 percent from 1990 to 2013, according to a report released in late August by Climate Transparency, a nonprofit organization. Echoing Bai’s statement, Niklas Hoehne from Germany’s New Climate Institute said that if G20 members were to rid themselves of their reliance on coal, this would have a significant bearing on their ability to both increase their climate pledges, and get their emission trajectories below 2 C.
The Paris agreement, made in December last year, set goals to limit the rise of global temperatures below 2 C compared to the preindustrial levels. The agreement will only come into effect with the ratification of at least 55 parties that account for 55 percent of total emissions. Lin Boqiang, director at the China Center for Energy Economics Research at Xiamen University, said the formal commitment made by the two major emitters would help the agreement to come into force. "Global powers could take the chance provided by the G20 platform to enhance policy coordination and help the agreement to come into force at an earlier date," he said.